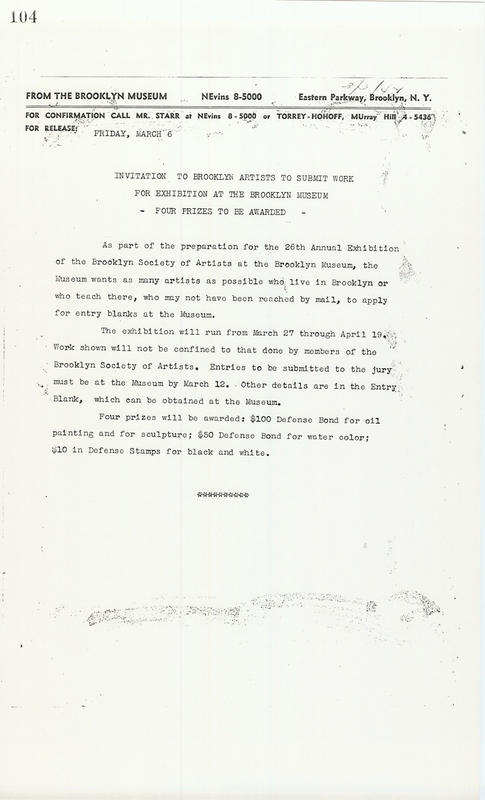 March 6, 1942 As part of the preparation for the 26th Annual Exhibition of the Brooklyn Society of Artists at the Brooklyn Museum, the Museum wants as many artists as possible who live in Brooklyn or who teach there, who may not have been reached by mail, to apply for entry blanks at the Museum. The exhibition will run from March 27 through April 19. Work shown will not be confined to that done by members of the Brooklyn Society of Artists. Entries to be submitted to the jury must be at the Museum by March 12. Other details are in the Entry Blank, which can be obtained at the Museum. Four prizes will be awarded: $100 Defense Bond for oil painting and for sculpture; $50 Defense Bond for water color; $10 in Defense Stamps for black and white. Brooklyn Museum Archives. Records of the Department of Public Information. Press releases, 1942 - 1946. 01-03/1942, 059. 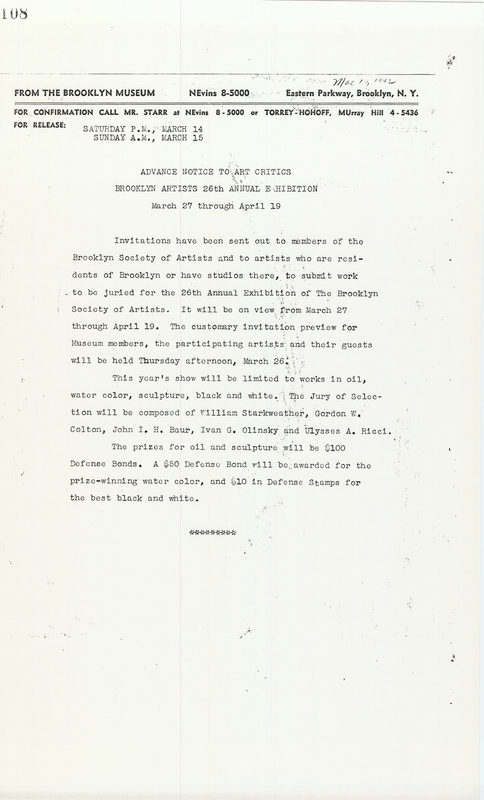 March 3, 1942 Invitation have been sent out to members of the Brooklyn Society of Artists and to artists who are residents of Brooklyn, or have studios there, to submit work to be juried for the 26th Annual Exhibition of The Brooklyn Society of Artists. It will be on view from March 27 through April 19. The customary invitation preview for Museum members, the participating artists and their guests will be held Thursday afternoon, March 26. Following the established precedent for its annual invitation exhibition of works by Brooklyn artists, the Museum has invited the artists to submit their works for selection by a jury. No more than two works in any medium may be submitted. In addition to the works which may be submitted to the Jury of Selection, the members of The Brooklyn Society of Artists may have not more than one work in any medium in the exhibition. This year's show will be limited to works in oil, water color, sculpture and black and white. The Jury of Selection will be composed of William Starkweather, Gordon W. Colton, John I. H. Baur, Ivan G. Olinsky and Ulysses A. Ricci. All the exhibitors in the show will be eligible for the prizes which have been most generously offered by The Brooklyn Society of Artists. The prizes for oil and sculpture will be $100 Defense Bonds. A $50 Defense Bond will be awarded for the prize-winning water color, and $10 in Defense Stamps for the best black and white. Any of these awared may be withheld if, in the opinion of the Jury of Awards, the work entered should not be of sufficient merit of the medium sufficiently represented. The Jury of Awards will be composed of Ivan G. Olinsky, Ulysses A. Ricci and John I. H. Baur. Brooklyn Museum Archives. Records of the Department of Public Information. Press releases, 1942 - 1946. 01-03/1942, 060. 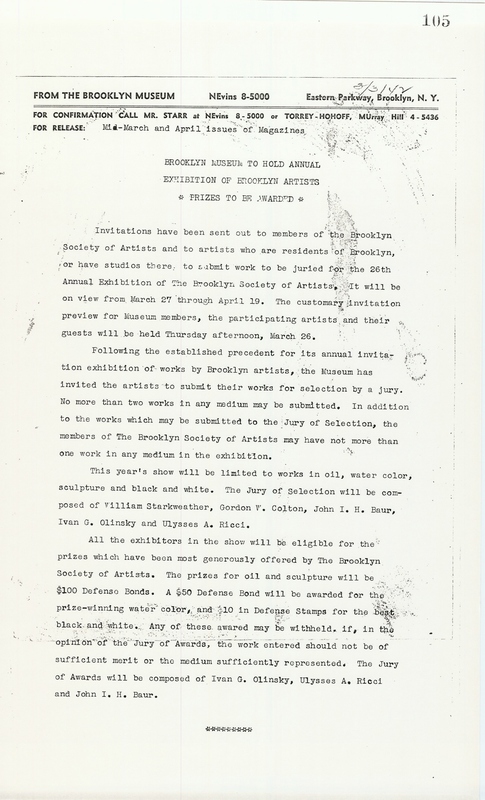 March 14, 1942 Invitations have been sent out to members of the Brooklyn Society of Artists and to artists who are residents of Brooklyn or have studios there, to submit work to be juried for the 26th Annual Exhibition of The Brooklyn Society of Artists. It will be on view from March 27 through April 19. The customary invitation preview for Museum members, the participating artists and their guests will be held Thursday afternoon, March 26. This year’s show will be limited to works in oil, water color, sculpture, black and white. The Jury of Selection will be composed of William Starkweather, Gordon W. Colton, John I. H. Baur, Ivan G. Olinsky and Ulysses A. Ricci. The prizes for oil and sculpture will be $100 Defense Bonds. A $50 Defense Bond will be awarded for the prize-winning water color, and $10 Defense Stamps for the best black and white. Brooklyn Museum Archives. Records of the Department of Public Information. Press releases, 1942 - 1946. 01-03/1942, 063. 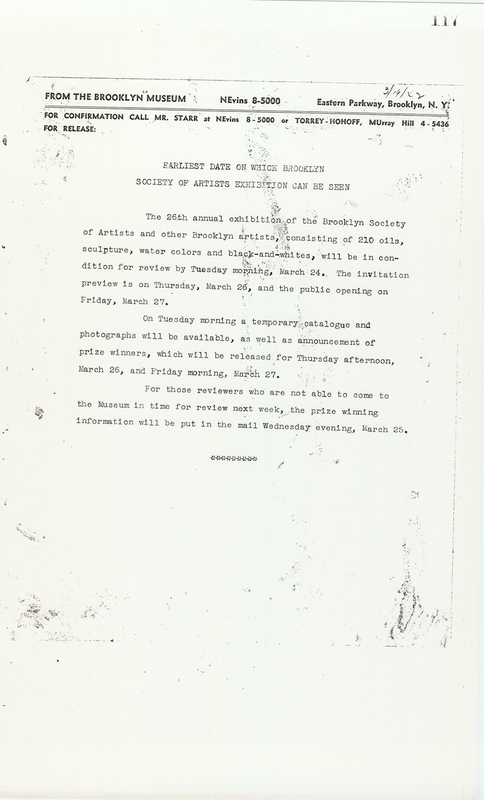 March 14, 1942 The 26th annual exhibition of the Brooklyn Society of Artists and other Brooklyn artists, consisting of 210 oils, sculpture, water colors and black-and-whites, will be in condition for review by Tuesday morning, March 24. The invitation preview is on Thursday, March 26, and the public opening on Friday, March 27. On Tuesday morning a temporary catalogue and photographers will be available, as well as announcement of prize winners, which will be released for Thursday afternoon, March 26, and Friday morning, March 27. For those reviewers who are not able to come to the Museum in time for review next week, the prize winning information will be put in the mail Wednesday evening, March 25. Brooklyn Museum Archives. Records of the Department of Public Information. Press releases, 1942 - 1946. 01-03/1942, 073. 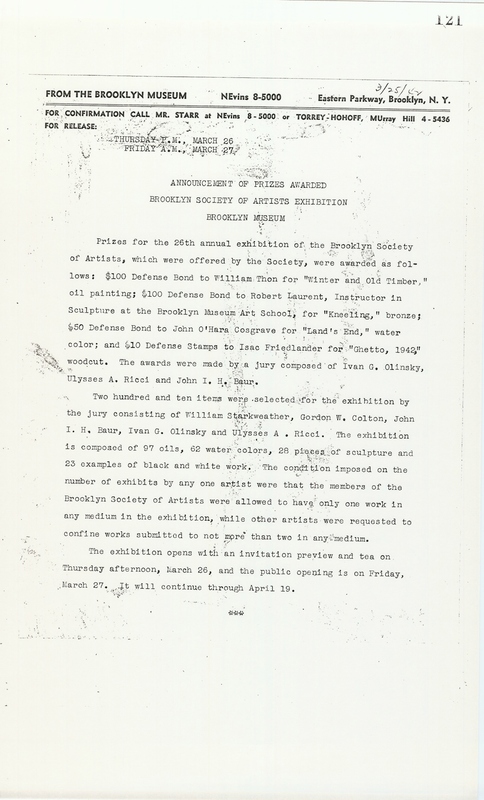 March 26, 1942 Prizes for the 26th annual exhibition of the Brooklyn Society of Artists, which were offered by the Society, were awarded as follows: $100 Defense Bond to William Thon for "Winter and Old Timber," oil painting; $100 Defense Bond to Robert Laurent, Instructor in Sculpture at the Brooklyn Museum Art School, for “Kneeling,” bronze; $50 Defense Bond to John O’Hara Cosgrave for “Land’s End,” water color; and $10 Defense Stampls to Isac Friedlander for “Ghetto, 1942,” woodcut. The awards were made by a jury composed of Ivan G. Olinsky, Ulysses A. Ricci and John I. H. Baur. Two hundred and ten items were selected for the exhibition by the jury consisting of William Starkweather, Gordon W. Colton, John I. H. Baur, Ivan G. Olinsky and Ulysses A. Ricci. The exhibition is composed of 97 oils, 62 water colors, 28 pieces of sculpture and 23 examples of black and white work. The condition imposed on the number of exhibits by any one artist were that the members of the Brooklyn Society of Artists were allowed to have only one work in any medium in the exhibition, while other artists were requested to confine works submitted to not more than two in any medium. The exhibition opens with an invitation preview and tea on Thursday afternoon, March 26, and the public opening is on Friday, March 27. It will continue through April 19. Brooklyn Museum Archives. Records of the Department of Public Information. Press releases, 1942 - 1946. 01-03/1942, 077.